Saint Patrick, the Patron Saint of Ireland - his date and place of birth are unknown, but he was born about the year 385, and it is thought probably south west England. He was not a native Irishman. At the age of 16 he was captured by a band of Irish pirates, taken to Ireland, and forced to serve under a heathen master, working as a herdsman. In the solitude of his work tending the sheep on the Irish hillsides, he found his God. In his "Confessions" (written in his old age) he tells us that he prayed many times a day in the woods and on the mountains, through snow, frost and rain. Some six years later he had a dream in which he was told to walk to a distant place, where he would find a ship to take him home. He walked over 200 miles to find that ship, and safely returned home and was reunited with his family. In another dream he was told to go back to Ireland, and to convert the people to Christianity. In order to do this he went to France, studied in the Monastery of Lerins, and was ordained at Auxerre about the year 417. In 432 he was consecrated Bishop by St Germanus on the death of Bishop Paladius in Ireland. He travelled the length and breadth of Ireland, teaching the faith, and making many converts, including several members of the Royal Family. Visiting Rome in 442, he was commissioned by Pope Leo the Great to organise the Church in Ireland. 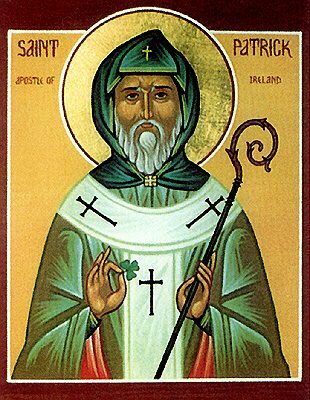 St Patrick established many monasteries for men and women, and many of these became recognised as seats of great piety and learning. Almost single-handedly, he converted a whole country to Christianty - the one true faith. Irish monks taught the faith in England and parts of Europe, and over the centuries many fine Irish priests came to Australia also. St Patrick is supposed to have chased all the snakes out of Ireland, and was also famous for his explanation of the Blessed Trinity, by using a three leaf clover. St Patrick died on March 17, 461.